Trigaux JP, Gevenois PA, Goncette L, et al. Bronchioloalveolar carcinoma: computed tomography findings. Eur Respir J. 1996 Jan;9(1):11-6. Lee KS, Kim Y, Han J, et al. Bronchioloalveolar carcinoma: clinical, histopathologic, and radiologic findings. 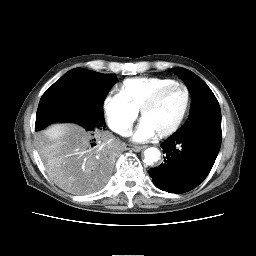 Aquino SL, Chiles C, Halford P.
Distinction of consolidative bronchioloalveolar carcinoma from pneumonia: do CT criteria work? AJR Am J Roentgenol. 1998 Aug;171(2):359-63. 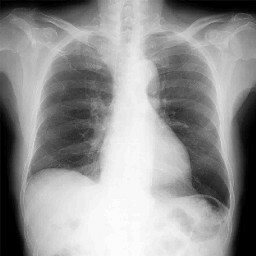 Akira M, Atagi S, Kawahara M, Iuchi K, Johkoh T.
High-resolution CT findings of diffuse bronchioloalveolar carcinoma in 38 patients. AJR Am J Roentgenol. 1999 Dec;173(6):1623-9. Kim TH, Kim SJ, Ryu YH, et al. 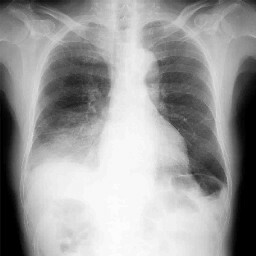 Differential CT features of infectious pneumonia versus bronchioloalveolar carcinoma (BAC) mimicking pneumonia. Eur Radiol. 2006 Aug;16(8):1763-8. Epub 2006 Jan 18. Patsios D, Roberts HC, Paul NS, et al. Pictorial review of the many faces of bronchioloalveolar cell carcinoma. Br J Radiol. 2007 Dec;80(960):1015-23. Epub 2007 Oct 16. Sawada E, Nambu A, Motosugi U, et al. Localized mucinous bronchioloalveolar carcinoma of the lung: thin-section computed tomography and fluorodeoxyglucose positron emission tomography findings. Jpn J Radiol. 2010 May;28(4):251-8. Epub 2010 May 29. Im JG, Han MC, Yu EJ, et al. 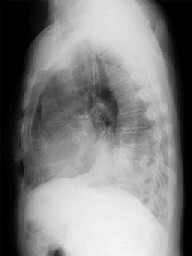 Lobar bronchioloalveolar carcinoma: “angiogram sign” on CT scans. 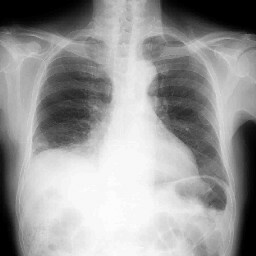 Vincent JM, Ng YY, Norton AJ, Armstrong P.
CT “angiogram sign” in primary pulmonary lymphoma. J Comput Assist Tomogr. 1992 Sep-Oct;16(5):829-31. Murayama S, Onitsuka H, Murakami J, et al. 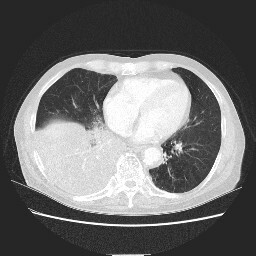 “CT angiogram sign” in obstructive pneumonitis and pneumonia. J Comput Assist Tomogr. 1993 Jul-Aug;17(4):609-12. CT angiogram sign: incidence and significance in lobar consolidations evaluated by contrast-enhanced CT.
AJR Am J Roentgenol. 1998 Mar;170(3):719-21. Computed tomography features of primary pulmonary non-Hodgkin’s lymphoma. King LJ, Padley SP, Wotherspoon AC, Nicholson AG. 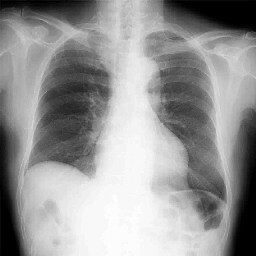 Pulmonary MALT lymphoma: imaging findings in 24 cases. Lee DK, Im JG, Lee KS, Lee JS, Seo JB, Goo JM, Kim TS, Lee JW. B-cell lymphoma of bronchus-associated lymphoid tissue (BALT): CT features in 10 patients. J Comput Assist Tomogr. 2000 Jan-Feb;24(1):30-4. Copyright（c）2014 medicaldirect.jp All rights reserved.